Kids certainly do enjoy trading cards, but often when they get engaged with the hobby, they get frustrated they cannot try some of the super premium releases from trading card manufacturers. 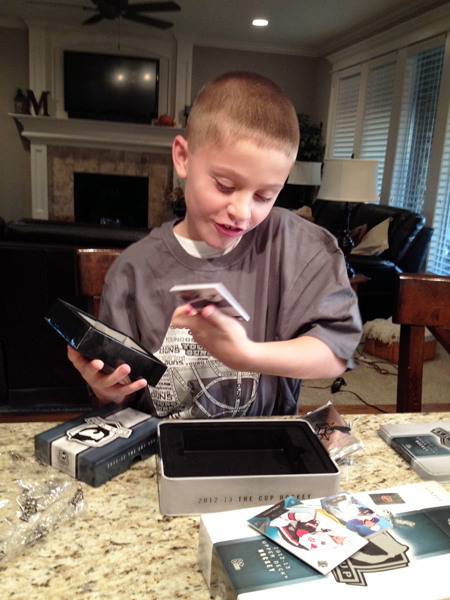 Upper Deck believes strongly that kids are the future of the hobby and while we don’t believe all of the brands we produce are designed for kids, it is clear that many kids would love the chance to open a high-end release. Take for example Upper Deck’s most premium hockey release of the year; The Cup. It is a product that is loaded with autographs and rare memorabilia cards, but at several hundred dollars per pack, well that is just out of most kid’s budget. 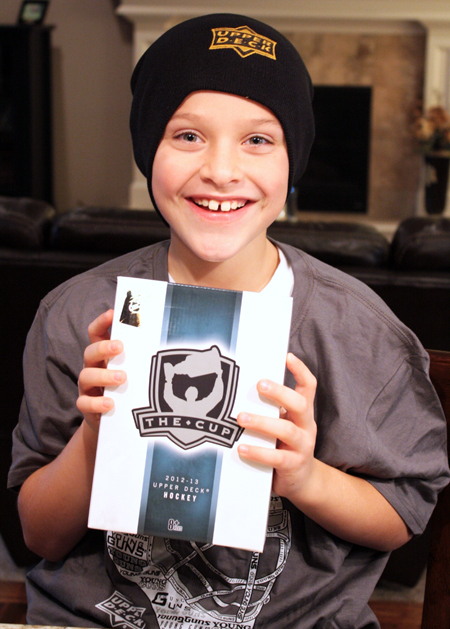 Upper Deck wanted to do something different however by working with parents to give some deserving kids the opportunity to open up a pack of The Cup and add to their collections the most premium hockey cards on the planet. We screened some candidates and came up with two very worthy families to share this opportunity with. Steven Schaffer has been collecting cards for over twenty years and he is sharing the hobby with his son who is now 7-years-old. Steven served honorably in the U.S. Army and unfortunately was deployed for a lot of his son’s early years. Upper Deck also believes strongly in supporting the U.S. military so these two were the perfect fit. And what better way to get some great father & son time then by opening up a pack of The Cup? 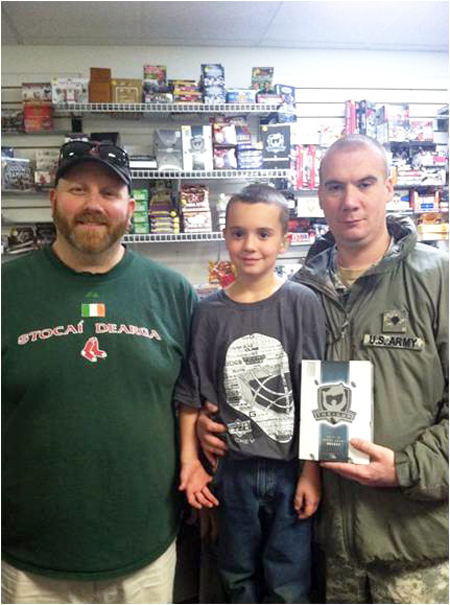 The father/son duo got their pack and headed over to their local card shop (Finnigan’s) to open the pack. Here’s what Steven had to share after they opened it and discovered a Wayne Gretzky autograph card! 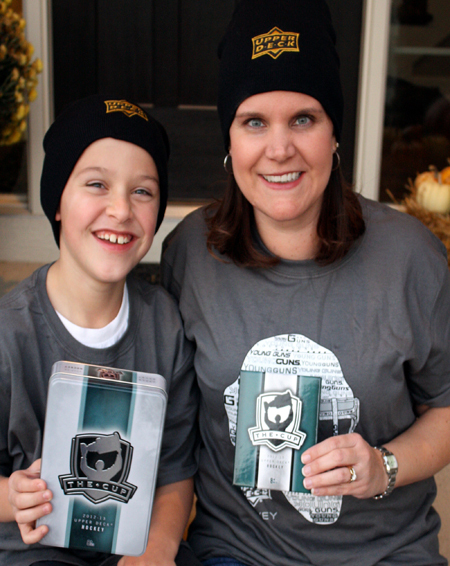 Next up was Heather Meade who is a self professed hockey mom who loves watching her son play. He decided he wanted to play the sport after an ice skating party when he was just 5-years-old and has been a passionate fan ever since. He really got into the sport when the Blackhawks made their memorable run to the Stanley Cup Final securing their first championship in decades. 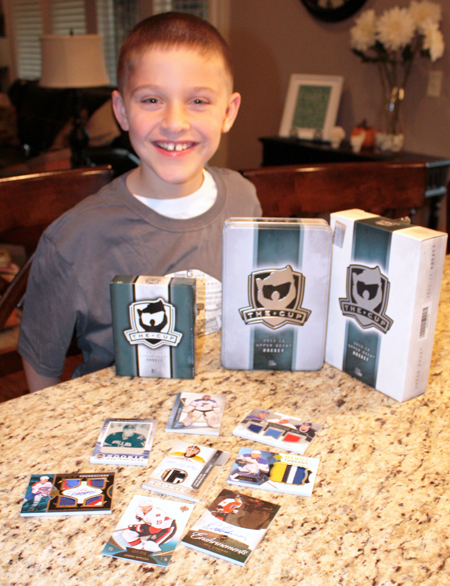 Kyle started collecting hockey cards when he was just 6-years-old after attending the NHL® Fan Fair in Raleigh, North Carolina. Upper Deck has a big presence at the show and he actually got a personalized card made at our corporate booth. His love for the hobby has been going strong since! 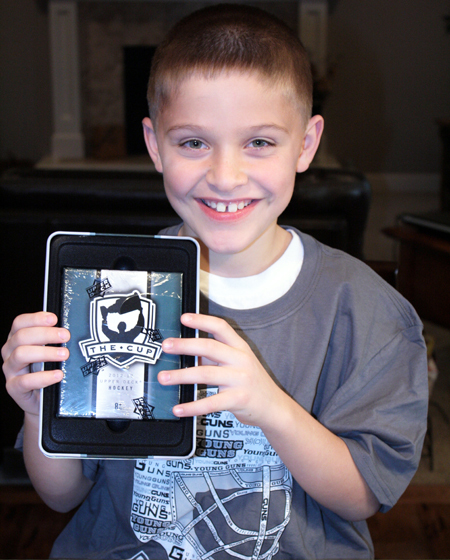 When his mom surprised Kyle with the pack, his excitement was palpable. 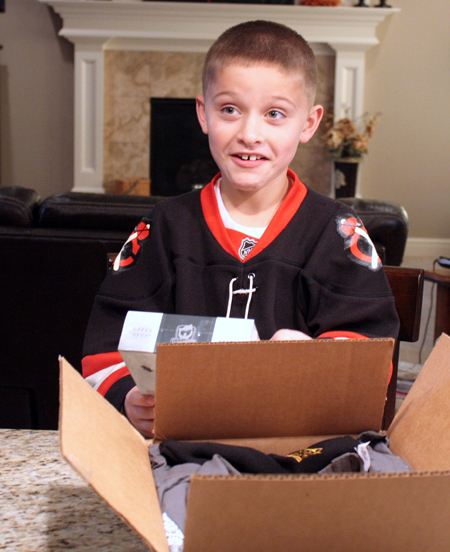 They say a picture is worth a thousand words, well here are six thousand words for you about what he thought of the experience of opening up UD’s most premium hockey product of the year. How much does Heather love the hobby? Well she has started a petition to get moms to stop throwing away their children’s trading cards. How awesome is that? We are hoping a lot of hockey moms sign up! We have only sponsored a Father of the Year promotion to date, but Heather makes us want to run a similar program for moms! Thanks for the support Heather! There would be no mom more deserving than Heather! You should definitely consider starting the award. She would be the perfect inaugural winner.